The licensed Winnie the Pooh medium jump will have residents of Pooh Corner jumping all day long. Adorable Pooh and friends will attract adults and children alike, as Piglet demonstrates how to properly bounce while Pooh, Tigger, Eeyore, and Rabbit help keep him going. Kanga, Roo and Owl can be found as well, and a pair of "hunny" pots above is sure to please everyone in the 100-acre wood! 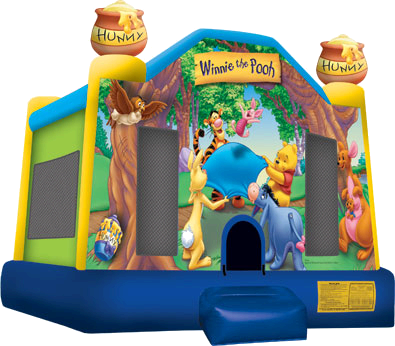 A great way to increase traffic at your next event, this medium Winnie the Pooh bounce house is part of a popular line of licensed Winnie the Pooh inflatable products, and is available in a large, more spacious Pooh jump.